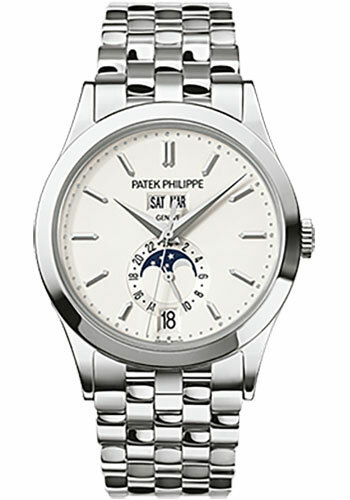 38.5 mm 18K white gold case, sapphire-crystal back, silvery opaline dial with gold applied hour markers, caliber 324 S QA LU 24H/303 self-winding movement with annual calendar, day, date, month in apertures, moon phases and 24-hour indication, sweep seconds hand, approximately 35-45 hours of power reserve, 18K white gold bracelet, fold-over buckle. Water resistant to 30 m.
38mm 18K white gold case, sapphire crystal back, two tone silver-grey dial with blue transfer print, self-winding caliber 324 S QA LU 24 H movement with day, retrograde date, month, moon phase, am/pm indications, and sweep second hand, leather strap with fold-over buckle. Water resistant to 30 meters. 38mm 18K white gold case, sapphire crystal back, silvery opaline dial with gold applied hour markers, self winding caliber 324 S QA LU 24 H movement with day/date/month annual calendar with moon phase and a.m./p.m. indication, approximately 45 hour of power reserve, leather strap. Water resistant to 30 meters. 38.5 mm 18K white gold case, sapphire-crystal back, charcoal gray sunburst dial with gold applied Breguet numerals, caliber 324 S QA LU 24H/303 self-winding movement with annual calendar, day, date, month in apertures, moon phases and 24-hour indication, sweep seconds hand, approximately 35-45 hours of power reserve, matte black alligator strap with square scales, fold-over buckle. Water resistant to 30 m.
38mm 18K rose gold case, sapphire crystal back, silvery opaline dial with gold applied hour markers, self winding caliber 324 S QA LU 24 H movement with day/date/month annual calendar with moon phase and a.m./p.m. indication, approximately 45 hour of power reserve, leather strap. Water resistant to 30 meters. 38.5 mm 18K rose gold case, sapphire-crystal back, silvery opaline dial with gold applied Breguet numerals, caliber 324 S QA LU 24H/303 self-winding movement with annual calendar, day, date, month in apertures, moon phases and 24-hour indication, sweep seconds hand, approximately 35-45 hours of power reserve, shiny chocolate alligator strap with square scales, fold-over buckle. Water resistant to 30 m.
38.5 mm 18K rose gold case, sapphire-crystal back, blue sunburst dial with gold applied hour markers, caliber 324 S QA LU 24H/303 self-winding movement with annual calendar, day, date, month in apertures, moon phases and 24-hour indication, sweep seconds hand, approximately 35-45 hours of power reserve, shiny navy blue alligator strap with square scales, fold-over buckle. Water resistant to 30 m.